Remember when climate crusaders told us coral atolls would be the first to go with sea level rise? Never mind. | Watts Up With That? From the coral atolls actually go with the flow we told you so department comes this Tuvalu denied moment. For the last 20 years climate scientists and campaigners have warned that atolls and low-lying islands are facing an imminent threat to their existence due to climate change and sea level rise which could soon cause the complete disappearance of entire islands. A new paper that reviews Pacific and Indian Ocean atolls including 709 islands reveals that no atoll lost land area and that 88.6% of islands were either stable or increased in area, while only 11.4% contracted. Abstract: Over the past decades, atoll islands exhibited no widespread sign of physical destabilization in the face of sea-level rise. A reanalysis of available data, which cover 30 Pacific and Indian Ocean atolls including 709 islands, reveals that no atoll lost land area and that 88.6% of islands were either stable or increased in area, while only 11.4% contracted. Atoll islands affected by rapid sea-level rise did not show a distinct behavior compared to islands on other atolls. Island behavior correlated with island size, and no island smaller than 10 ha decreased in size. This threshold could be used to define the minimum island size required for human occupancy and to assess atoll countries and territories’ vulnerability to climate change. Beyond emphasizing the major role of climate drivers in causing substantial changes in the configuration of islands, this reanalysis of available data indicates that these drivers explain subregional variations in atoll behavior and within-atoll variations in island and shoreline (lagoon vs. ocean) behavior, following atoll-specific patterns. Increasing human disturbances, especially land reclamation and human structure construction, operated on atoll-to-shoreline spatial scales, explaining marked within-atoll variations in island and shoreline behavior. Collectively, these findings highlight the heterogeneity of atoll situations. Further research needs include addressing geographical gaps (Indian Ocean, Caribbean, north-western Pacific atolls), using standardized protocols to allow comparative analyses of island and shoreline behavior across ocean regions, investigating the role of ecological drivers, and promoting interdisciplinary approaches. Such efforts would assist in anticipating potential future changes in the contributions and interactions of key drivers. Importantly, islands located in ocean regions affected by rapid sea-level rise showed neither contraction nor marked shoreline retreat, which indicates that they may not be affected yet by the presumably negative, that is, erosive, impact of sea-level rise. Second, this review reaffirms that atoll island areal change was mainly influenced by island size. While the smallest islands (<5 ha, 52.90% of islands) exhibited contrasting areal changes (i.e., stability, increase, or decrease in size) and highly variable values of areal change (from −22.7 to +125.5%), the islands larger than 5 ha (47.10% of islands) generally experienced areal and positional stability. It is noteworthy that no island larger than 10 ha decreased in size, making this value a relevant threshold to define atoll island areal stability. We therefore propose to use this threshold, first, to define the minimum island size required for human occupancy or exploitation, and second, to assess atoll and atoll countries and territories’ vulnerability to climate change. Using this threshold for future island development (e.g., resort island) would considerably limit the risk for new developments to be negatively affected by island areal and positional instability, on condition of also avoiding any human intervention that may alter island sediment budget (e.g., sediment extraction) and natural dynamics (e.g., obstruction of sediment transport and deposition by constructions). In addition, the physical instability of small islands (<10 ha) suggests that atoll countries and territories’ vulnerability to sea-level rise is inversely proportional to the size of the islands composing them. This for example means that the Republic of Maldives (mainly composed of small islands) is, from a geomorphic perspective, more vulnerable to climate change than the French Tuamotu Archipelago (made up of larger islands). October 29, 2018 in Sea level. In my intro college geology book it describes how coral atolls rise with sea levels, they have done so for millions of years. Young Charles Darwin figured this out in the 1830s, an hypothesis since confirmed. Even some of the Maldives Islands are increasing in size. The ones that are decreasing are the islands where they used explosives to blast through the protective reefs in order to make it easier from boats to get in and out of the harbor. 405 square meters of reef were blasted to create a channel for boats to get out to sea. That is about 4400 square feet, which is smaller than my postage stamp lot that my house sits on. This gives the fishermen a safe way to get in and out of the harbor, and allows visiting sailboats to bring tourists and money to the community. Probably need to be done periodically to keep the reef from growing back into the channel, like trimming a hedge. Talk about a tempest in a tea cup. It’s not just this one time. It’s been going on for a while and it has had a negative impact on erosion. A study of Funafuti Atoll in the Pacific island nation of Tuvalu, published in 2014, showed that monsoon winds and storms that break up coral and deposit sand on the atolls can help the islands grow naturally. Whether this works for coral atolls elsewhere in the world is unknown, but the study’s author, Paul Kench at the University of Auckland, New Zealand, and his colleagues, say that the Maldives seem to be showing a similar effect. “Satellite pictures and Google Earth show that some islands are growing, while others are shrinking,” Ahmed says. The issue is the weight of money. Put enough money on a Pacific Atoll and it will stop sinking. Money weighs less than air. However, if its not tied down it floats off to a personal bank account elsewhere. Money can even stop the sea rising. In this case the flow needs to be constantly increasing. Sea inflation can only be stopped with more money. 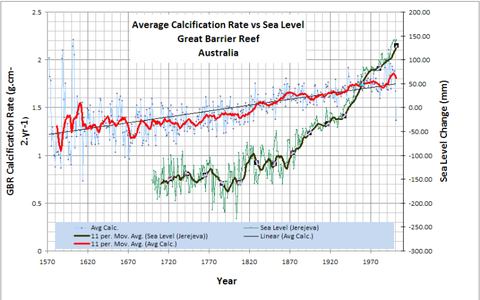 Could also be that the sea level rise has been negligible during the study period. Exactly so – or perhaps claims of “rapid sea level rise” have no basis and are simply false. Yes – nothing new here. Darwin was the first to theorise about coral islands. Don’t our alarmists read their classics? Can we start a bet: how will the IPCC move these goalposts? Redefine sea level? Redefine atoll? Redefine both? How did this make it past the gatekeepers and pal review. Ah…yes, predictions vs. reality, good work indeed. Aka, “large non-moving naval targets”. Still an option, but in the age of precision conventional strike, nukes don’t loom large. All China’s SCS fortified islands would disappear overnight if the shooting war balloon went up. Many are the retired US military personnel who yearn not only for nuclear powered battleships but the use of nuclear ordnance to reduce certain targets to radioactive glass covered areas of scenic interest. True, but not an ideal ordnance selection for taking out a Chinese artificial island in the SCS. GBU-43/B Massive Ordinance Air Burst – you take control of the air and it deliver out the back of a C-130 or C-17A, GPS guided. Below ground structures, storage, runways. No more forwards operating bases on South China Sea atolls. No unconventional weapons required. Regrettably, all considering attacking the PRC’s artificial islands in the South China Sea seem to assume that lumbering aircraft could get close enough to release a MOAB or a rod from God. I suspect that the PRC has considered such aerial attacks and can defend against them. You apparently didn’t comprehend this part Jim. 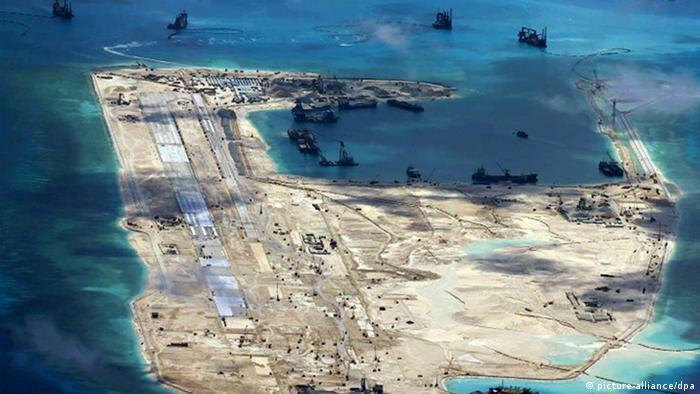 The US has lots of options against Chinese artificial islands, which are essentially immobile aircraft carriers. At the low end is simply to treat them like air bases and crater the runways with cluster munitions or large surface burst explosives. Fuel air explosives could raze above ground structures and make very bad days for any personnel within the blast radius. Plus other options short of nuclear explosives. Delivery systems could range from naval artillery fires, to unguided rocketry to drone or manned aircraft to guided ballistic or cruise missiles. So would a Tsunami created by a Rod drop. Nope. They’re clearly your compadres. It was published because they included this, this and that. Could not just report the facts but continued into more ‘implied’ speculative endeavors. which in turn implies that it is imperative to limit as much as possible human interventions that may destabilize the fragile equilibrium of such islands. Assessing atolls’ and atoll countries’ vulnerability to climate change using this threshold would offer a first comprehensive overview of atoll status and of atoll countries’ needs in terms of adaptation to climate change. 11% of coral atolls at risk due to climate change. Agreed, I was thinking the same thing. If you look at the actual study, “climate” is mentioned 47 times, “human” 18 times, “sea-level rise” (those exact words with hyphen) 34 times. Yeah, not like it was in the good old days Steven when editors had to read such papers after dark or lose their jobs. This paper is no beachhead, though. I learned this as a first year geology student in the 1950s. Darwin figured it out in the1830s! When they drilled Bikini Atoll prior to a US nuclear bomb test, the coral formation went down,IIRC, some 120m or so before intersecting volcanic rock, about the amount the reef had grown since sealevel was down at that level during the glacial max. Incidentally, the coral had to grow a heck of a lot faster for the first several thousand years of the the holocene, given that it’s averaged about a meter a century since there has been any appreciable melting. I would think it has grown as much as 2-3m a century during maximum rise rate. What do you think Moshe? That old coral isn’t raising a sweat at today’s rate of of less than a tenth of the max. When I learned that climate scientists didnt know this, I realized they were unaware that other disciplines had resolved these matters long ago. I realized they relied on apriori reasoning in their speculations and studies, ya know, the kind that clever teenagers, lacking empirical knowledge, use to argue with their parents. The scientists didnt bother to research what was known. They ‘relearned’ by starting at square one. They don’t turn out well rounded scholars anymore. 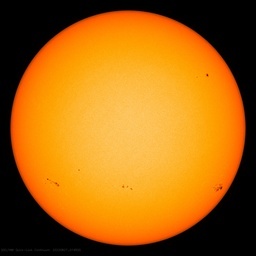 Hansen an astronomer, having stumbled upon something about CO2, looked at Venus one day and said Holy Cow, look what happens! Westside highway will be gone, etc. He delved and began to learn we had hotter periods and, Lord, 100,000yr stetches of bleak continental glaciers, Holocene maxes and mins, raspberries in Svaalbard, even crocodiles. Mann fought back and sorted through a bunch of pine trees in Colorado and one in Siberia and succeeded in removing all traces of the the LIA and the MWP. I was understanding at first. And then they said the river deltas will be all submerged (I leave this for homework Moshe to find out why this won’t happen). Thats how I came to be a sceptic. Nope. The amount the reef has grown since the top of the volcano sank below sea-level a couple of million years ago. Bikini was a 120 meter high limestone plateau during the glacial maximum like almost all atolls. A hundred thousand years isn’t nearly enough to erode that much limestone. No, but the corals did have to move upslope several meters per century. As I like to point out No coral reef anywhere in the world is older than about 10,000 years, because then it was dry land where the reef is now. However the reef has very often grown on top of a long dead reef from the previous interglacial which in turn grew on top of another dead reef and so on. Not that it matters, but they actually drilled several cores at different places on Eniwetok. All the cores had to go through over a kilometer of coral, coral debris, shell fragments, limestones and dolomites before they reached basalt. They hit the volcanic rock below 4000ft. Why so thick? The atoll is sinking very slowly. Actually, it very likely will happen The problem isn’t so much sea level rise, although that won’t help. It’s that every major river in the world has been dammed — often in multiple places — for hydro power, navigation, irrigation and/or flood control. That cuts off sediment flow to the delta. The deltas are pretty much by definition, unconsolidated sediments and they are doing what unconsolidated sediments do — consolidating. Consolidation depresses the surface — which isn’t good if you’ve built on “land” with only a meter or two of freeboard. In some cases — Southern Louisiana for example, the deltas are also eroding now that they are no longer being extended by new sediments. …and no island smaller than 10 ha decreased in size. The conclusion seems correct but it is strange that no-one picked that up in peer review. I guess the editor didn’t read the paper. Probably answers how it got through the gatekeepers. By swallowing the climate change narrative completely and emphasizing it. Throughout they act as if catastrophic sea level rise is a fact and are simply reporting how some islands are growing despite the rise. “This review first confirms that over the past decades to century, atoll islands exhibited no widespread sign of physical destabilization by sea-level rise. Atolls are made of coral. Coral grows and therefore atolls grow. link Apparently, most atolls can grow fast enough to keep up with sea level rise. Which should already have been common knowledge, since they kept up during the last glacial-interglacial transition, and those before it, when MSL was rising faster than now, by leaps and bounds. Atolls are made up of dead coral. The living part still growing are the off shore reefs. Another fact often completely omitted from view is that atolls are often located on top of old volcanic sea mounts. In former times there were active volcanoes which later stopped erupting. And then often the volcanoes started slowly ‘collapsing’ from sheer weight. Also wave action canwear them down while sea currents can add more sand building them up.. In short atolls are very complex geologically. Which, even according to official climate science, has only been about 2.5 inches over those 45 years. The climate pseudoscientists forgot to study stratigraphy and carbonate sedimentology before proclaiming the seas were coming to getchya. What are hoa shores? I tried searching but came up with nothing but property and tourist related stuff. I can’t figure it out either. The mention of them to a local along the upper Atlantic coastline might well elicit references to beach areas where the oldest profession is regularly practiced. In which case the final -a is redundant. Good question. To Americans, that suggests Home Owners Association. But it might refer to a type of atoll, the typical specimen of which is Hao Atoll in French Polynesia. I hope someone in the know answers your excellent inquiry. I thought a hoa was a streetwalker in inner-city Detroit. No? Hoa is the Jewish pronunciation of what you describe. Ask, and you shall know. A hoa is a shallow channel between two of the individual ‘motu’ of the reef. An individual hoa may be blocked at either the lagoon side, the sea side, or both. Also, it might be a functional hoa, even if only at full tide. The hoa should not be confused with the more prominent reef passes which are deeper, always open, and always functional. On the lead picture above, the gap between islands #18 and #19 looks to be a hoa. The channel in the middle of island #17 which almost makes it through seems to be a hoa blocked on the ocean side. In contrast, island #20 has a proper reef passage on each side. This is why Leonardo DiCaprio bought an Island just feet above sea level to build an Eco Resort. Virtue signalling can actually part the seas. That entire businessinsider article is 100% pure BS. Blackadore Caye is a low lying shoal in an extremely shallow lagoon and there is no evidence that Mayan or anyone else ever built on it. There is very little fishing at all in the lagoon because there is almost no structure, it’s just foraminifera shells and carbonate mud with a little sea grass. The picture of the resort they show could be considered fraud if showed to any investor because the area looks nothing like that. See the YouTube video, it shows exactly what you describe. The Insider pictures are just ‘artist’ renditions of said resort. So I guess you are right!? So, haul Leo before the bar of justice of one jurisdiction or another, or all of them, for fraud? Why should he be different from Mann and the rest of the Team? Leo is now part of the political class, immune from prosecution. As couple of Scientists can be thrown under a bus when the time comes. You could be right. But recently the careers of some of his fellow Loony Lefties in Hollywood have suffered as a result of their lunacy. DiCaprio is a UN ambassador for Climate Change. So that I’m sure makes him immune to prosecution anywhere. and we also know that sea level has risen very fast post the Ice age. I think that a rate maximum has been measured some 9000 years ago at 60mm/year. How long has coral been around? How many millions of years? How were they ever able to cope with changes in sea level in the past? Class Anthozoa has been around since the Precambrian, at least 570 million years ago (Ma). Modern corals (scleractinians) have been around at least since the Middle Triassic (~247 Ma), ie before the dinosaurs. They survived oceans much, much warmer than now. Indeed, they thrived in them. This for example means that the Republic of Maldives (mainly composed of small islands) is, from a geomorphic perspective, more vulnerable to climate change…. 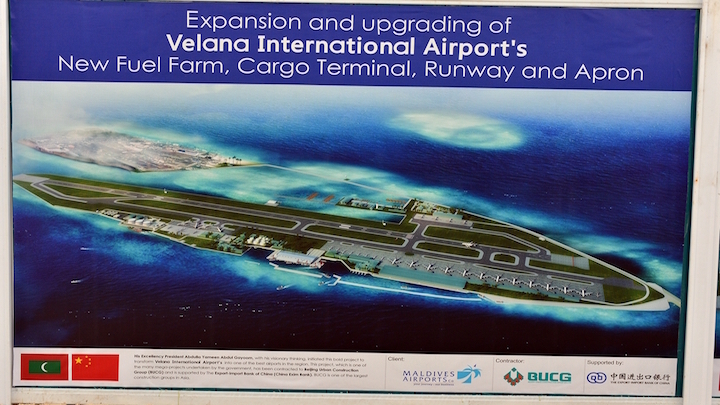 Do these idiots writing this crap realize if China can make new islands….Maldives can pump enough sand to make new airports……these islands are not vulnerable to climate change? Besides which, how much of the Netherlands is below present sea level? With enough tourist dollars, building barriers is a snap. And the tourists will love sun bathing naked atop the scenic barriers. They do it to Miami Beach all the time….. If you pile up enough sunburnt turistas en la playa, they form a movable breakwater all on their own. N’Orluns’ Katrina problem wasn’t so much so much of its being below MSL, but the substandard guvmint-standard barriers to the inrush of a surging sea built there over the decades. Pumping sand on a large scale can actually be rather risky. It may drastically change currents and erosion, so building that new airport may in the future cause some other island to erode away. But that will of course be blamed on climate change. This report is clearly false. The authors used actual observations and statistics based on the observed facts. There were no models involved, let alone tree rings. Also the conclusion is wrong. Proper science requires a researcher to start with the conclusion and work backwards to create the ‘evidence (using models is best evidence as they can be programmed toward the conclusion). I wasn’t aware that losing coral atolls was a prediction of climate change. Why would anyone think that? The main potential problem is flooding of low-lying areas…or, I suppose, erosion on one side and accretion on the other is possible, which would mean people would have to eventually move away from the eroding shore. But I haven’t read the paper, that’s just speculation. It seems to me this was already covered in another post a while ago. Yeah right Kristi, there’s a search function on this site, try it some time. Sorry, Kristi, but this scare was high on the list of bogus CACA concerns. Really, dunno where you’ve been. I won’t post more links only because they’ll send me straight to moderation. The interesting one was the activist pinup the “Marshall Islands”. The behaviour was not even uniform there, islands were more likely to be increasing in size rather than decreasing. Sadly Kristi, this prediction was lost in an inundation of other bogus predictions that rival the Great Flood of Nostradamus. And remember the Mayor of Tangier Island, Maryland, lecturing former VP Gore on the reality of Tangier Island during a CNN-televised Town Hall meeting a few months back. The Island has no problems whatsoever with sea-level rise, but the wakes of ships passing to and from Baltimore Harbor were washing away the shoreline. The Mayor has been trying to get the Government to build a sea wall to end the erosion. When Cyclone [Hurricane] Bebe struck Tuvalu in 1972, Fongafale, the main islet of the Funafuti atoll increased by 15% overnight. Tropical cylcones are a primary driver of atoll aggradation on their windward sides. A series of fossil cyclone banks parallel the seaward side of main airstrip on Fongafale. The provide a vital storm wave barrier protecting houses and infrastructure of the islet which is only 2 m or so above MSL. I seem to remember an article here which said that parrot fish nibbled at the coral which released small sandy particles which in turn was swept by the sea onto the atolls and kept them rising with sea level. Has overfishing on the atolls that have shrunk resulted in fewer parrot fish and hence less raw material to build up the atolls? This is indeed a problem on many atolls. No parrotfish – no coral sand. This paper got me to wondering. What if it became fashionable among young students to research something that debunks climate change alarmism? This is the way fashion works. Sooner or later a paradigm becomes “stale and boring” Bucking the trend is a natural reaction within the young, thinking that they are being reactionists, while in fact they are conformists among their peers. We have all been there. SUMMARY: Mass coral bleaching has been shown to be caused by prolonged periods of thermal stress. The DHW product accumulates any HotSpots greater than 1 °C over a 12- week window, thus showing how stressful conditions have been for corals in the last three months. It is a cumulative measurement of the intensity and duration of thermal stress, and is expressed in the unit °C-weeks. DHWs over 4 °C-weeks have been shown to cause significant coral bleaching; values over 8 °C-weeks have caused widespread bleaching and some mortality. The global data are at 0.5-degree (50-km) resolution and are updated twice-weekly. Seems rathe ambitious to estimate coral bleaching in areas where there are no corals. Or islands for that matter. Of the islands that decreased in size, how many were hit by storms such as the one that obliterated East Island in the French Frigate Shoals this month? Are sea levels rising because atolls are growing in size, or are atolls growing because sea levels are rising? Why it is not possible to see the original work? There is something odd about the conclusions. It says that only small islands decreased in size. OK, no problem. Then it says that no coral atoll decreased in size. OK, no problem. Then it says that Maldives is the nation most at risk from rising sea levels because “all the islands are small and those are the ones that decrease in size”. And it adds that the Maldives are comprised of a set of hundreds of coral atolls. So logically, if all coral atolls increased in size, being “small” is not as relevant as being a coral atoll when it comes to global warming. It could be rewritten as: Only non-coral islands of less than 10 ha are threatened by sea level rise because that is less likely to be misinterpreted. This slip of logic is of a style that is unlike the rest of the paper. I wonder if a reviewer required that the conclusion be drawn that “Maldives are at risk because they are small” based on the fact that only small islands reduced in area, ignoring that fact small coral atolls didn’t? I smell a reviewer with bias. In response to John Bell (1st poster here), yes atolls may react to sealevel rise with reef growth, and may therefore continue to exist despite sealevel rise. However, the geological record also shows us stable reefs, catchup reefs and drowned reefs. So, there are cases where reefs remain stable, cases where they are drowned temporarily and then reef growth catches up to sealevel rise, and cases where the reef is drowned by sealevel rise. Of course, there are also cases where reefs, and indeed all landforms are exposed by sealevel drops. I am in total agreement with the study here, but just pointing out that the geological record shows us all sorts of cases.